Whether it's grilling season or any season, our bbq sauces are always in season. Made with premium, Michigan-grown tart cherries our bbq sauces are just the right blend of sweet, savory and heat. Looking for a sweet and smoky bbq sauce? Try our Original Cherry BBQ Sauce. Perfect for sausages, cocktail wieners, over chicken, and even on cold-cut sandwiches. Want a more savory option? 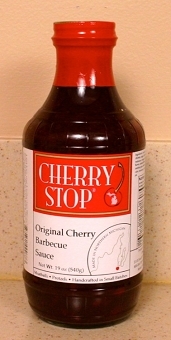 Try our Cherry Pit BBQ Sauce. In true pit-style, this bbq sauce packs a little bit of heat. Still on the mild side, but just enough flavor to make those baby back and spare ribs fantastic! Looking for a new bbq experience? Try our Cherrolina BBQ Sauce. Using mustard as its base, this sauce is in a true Carolina-Style. This sauce is a little sweet, and a little tangy (not too mustardy). Perfect on pulled pork, chicken, hamburgers, and we have even used it to make deviled eggs and potato salad. Yum!